So there is a serious failure by the government on the railways. This should be an issue that Labour holds to its heart but where are they? 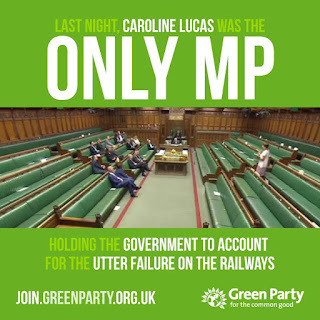 The picture of Caroline Lucas being the only MP to hold the Tories to account is a stark one. Where are Labour and the Lib Dems? Why isn't the BBC and other media asking this question? Why are the public not in open revolt over the failure of their MPs to represent them? If other opposition (and I use the word lightly) MPs are worried about the Tory gerrymandering of the boundaries which will ensure Conservative power for generations to come then perhaps they should be standing alongside the Greens in fighting for public services, demonstrating to their electorate that they are able to do what they were elected for. Sadly the state of politics in the UK is beyond a joke. The failure of the political system has left us with a the democratic deficit so large that only a complete change will repair it. Corbyn has finally started to mutter about proportional representation but sadly doesn't seem any more committed to it that he was about the EU. Labour needs to wake up and follow the Greens who are clearly leading the way. Great image of parliamentary democracy in action... Do you know what the 'debate' was about, Stuart? The state of the railways, specifically Southern.